Openshot Video Editor Gets HUGE Update - 30 New Effects, Preview Window, Green Screen, PPA... - OMG! Ubuntu! OpenShot – one of the best video editor available for Linux – finally has a PPA! That’s news enough in-itself as it means pain free installation but the even better news is it now comes complete with effects! 30 awesome video effects are now included – including Chroma Key (green screen) allowing you to create all sorts of awesome videos. These are in addition to the 15+ transitions included! And in the spirit of OpenShot, it’s as easy as dragging and dropping an effect on a clip. The PPA also contains the latest versions of all necessary dependencies that OpenShot requires – such as FFmpeg, MLT, Frei0r, and x264 so no worries about not being able to run it! WARNING: Currently installing OpenShot via PPA will break video playback. You are advised to use the .deb’s from the official site or follow the advice here. So far testing the new version of OpenShot in Karmic I’ve found it to freeze up a lot so karmic users be warned. 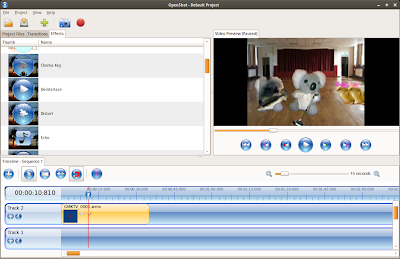 Other wise it’s the same awesome quality I’ve come to expect from the OpenShot team who, let’s face it, have created the de facto video editor for Linux. OpenShot is to Linux what iMovie is to OS X. Be sure to check out the following official demo video!